Company extends winning streak to four consecutive years on top of the Vocal IP Networx program. 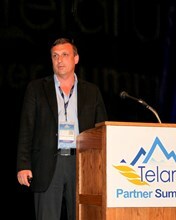 Telarus and its partners are a razor sharp selling organization. It's a privilege working with them. Telarus, Inc., distributor of commercial data, IP, voice, and cloud service and patent holder of real-time carrier quotes, today announced that it was named 2013 Top Partner by Vocal IP Networx. This marks the fourth year in a row that Telarus has received this honor since joining forces with Vocal IP Networx back in 2009. Vocal IP Networx is well known for their creative solutions, superior support, and their overall low churn rate. Telarus brought on Vocal IP Networx as one of their first cloud voice providers and have experienced steady growth over the last four years. Vocal IP Networx is a national facilities-based ISP and IP telephony services provider headquartered in New York City. Vocal IP Networx is home to the industry’s most productive hosted phone system. Combined with the industry’s leading disaster recovery platform, Vocal IP Networx delivers the ultimate technology experience for enterprise clients. Founded in 1996, Vocal IP Networx serves enterprise companies and specializes in the retail, finance, and healthcare markets. Vocal IP Networx operates datacenters in Newark, NJ, NV and Chicago. For more information about Vocal IP Networx, please visit: http://www.telarus.com/carrier-information/vocal-ip-networx.html.